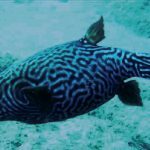 Mauritius, a small island located roughly between Madagascar and the Maldives in the center of the Indian Ocean, has a unique fish fauna which includes some of the rarest and most expensive species available in the aquarium trade. Paracheilinus piscilineatus… Centropyge debelius… Rhinecanthus cinereus (probably not actually endemic here)… Pseudojuloides xanthomos and Cirrhilabrus sanguineus (*swoon*). 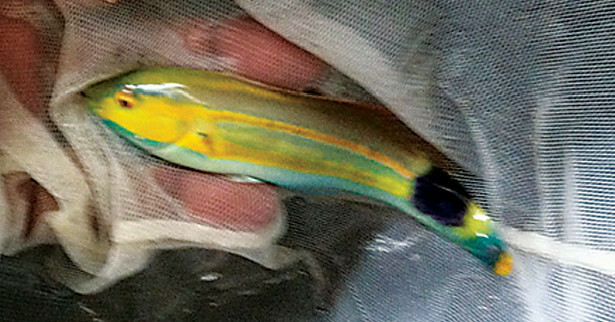 The latest name to add to this list is a distinctive yellow-striped wrasse that has been trickling into aquarium exports, Halichoeres gurrobyi. 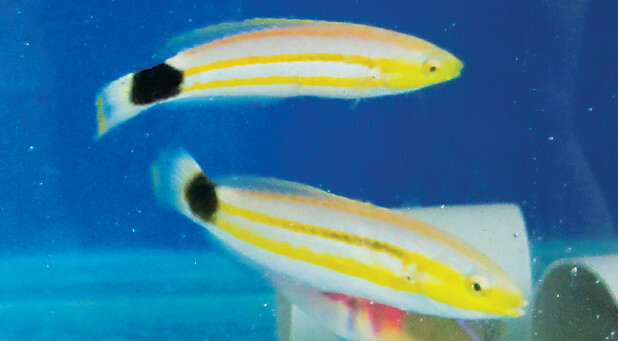 This new wrasse belongs to a species group that includes the Orangeline Wrasse (H. hartzfeldii) of the West Pacific and its Indian Ocean sister species H. zeylonicus, as well as another rarity known only from Mauritius and nearby Reunion, H. pelicieri. All three share a similar juvenile pattern of yellow stripes and a black caudal spot, though in the new H. gurrobyi this dark marking is greatly exaggerated to cover the entire caudal peduncle. The yellow lines are also more pronounced, forming a yellow mask that covers much of the head in larger specimens. It remains uncertain how the terminal phase male might differ in its coloration as the largest specimens collected thus far have still retained remnants of this juvenile patterning. 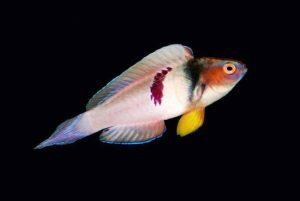 Obviously, for any aquarist who happens to acquire this rare wrasse, it is worth documenting this transition in photographs. There’s precious little information available concerning what this fish does in the wild. 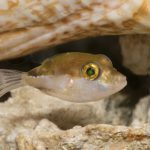 The type specimens were collected in relatively shallow waters (12-20m) in Grand Bay, Mauritius, though there is no information concerning what sort of habitat has allowed it to remain hidden for so long. 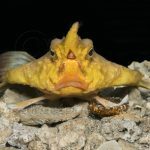 The closely related H. pelicieri is said to favor sand and rubble habitats at depths of 20-35 meters, and it would obviously be informative to know how these two might differ ecologically. 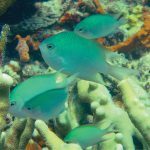 It’s particularly unusual to have such closely related species endemic to this small of a geographic range, which could indicate that at least one of these is more widespread in the waters of the Southwest Indian Ocean. The species, described in the latest edition of JOSF, was named for “Yam” Gurroby, owner of Ornamental Fish World, Ltd, who has been collecting and exporting this wrasse for the aquarium trade. 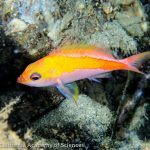 The Gurrobys are clearly quite adept at catching elusive wrasses, so let’s hope we’ll start seeing some Cirrhilabrus sanguineus sometime soon.